A nice guy in his late twenties, his house at the corner of Drake Street and South Orchard Street had several wooden totem poles in the front yard. A gifted mechanic, he overhauled and resold dozens of lightweight British three-speeds (the preferred commuter bike of the day). He worked out of a basement store front on State Street. In the summers of 1970 and 1971 he tuned up old cruisers, covered them in Tom Sawyer whitewash and set them free on State Street. (A student and tourist shopping district that connects the Wisconsin State Capitol with the University of Wisconsin campus.) Madison’s first free bicycle program was born. He sold his inventory, closed his business and moved away. Wisconsin winters and neglect ended Madison’s free bicycle program. 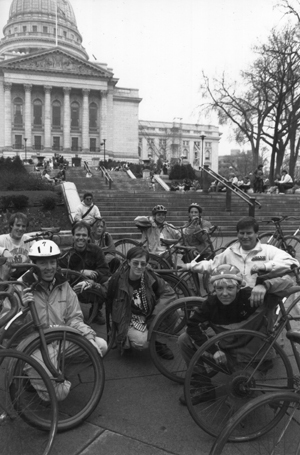 In June 1995, during an interview with Lisa Goodman of the Bicycle Transportation Alliance, Roger Charly expressed a desire to bring back a free bicycle program to Madison. Budget Bicycle Center’s Used Bicycle store had plenty of traded-in bicycles along with the parts and mechanics to get them up and running. Jillian brought together Clem Paine from Wheels for Winners, Arthur Ross from the City of Madison Transportation Department, and Roger Charly from Budget Bicycle Center with bicycle advocates and volunteers. 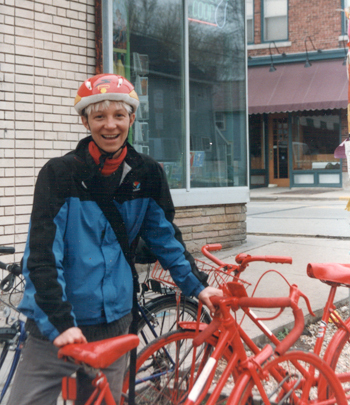 Her goal was to launch 30 free red bicycles at the Capitol on May Day, to kick off National Bike Month. She successfully did just that! We wish to thank Jillian Corbett for her energy and imagination as the founder of the Red Bike Project. Jillian Corbett (right) and Roger Charly (left) along with others instrumental in launching the Red Bike Project. Wisconsin State Capitol, May 1, 1996. In 1996, 1997 and 1998 the bicycles were let loose on the streets with no locks. The return percentage dropped every year. By 1998 less than half the free bicycles survived. Testing a library book style check out system that was successful in other citys’ free bicycle programs, Yellow Bikes were launched in 1999. Unlike the Red Bicycles, an individual (or group) could check out a Yellow Bicycle with a refundable deposit. The Yellow Bicycles were still free to use, like a library book, the riders just brought it back when they no longer needed it. All Red Bikes got returned by the end of November to keep them out of the damaging winter elements. The check out “Yellow Bike” experiment yielded near 100% return rates, so starting with the year 2000 season all the Red Bikes switched over to the free check out platform. To avoid confusion, the Yellow Bikes were also painted red at the beginning of the 2000 season. 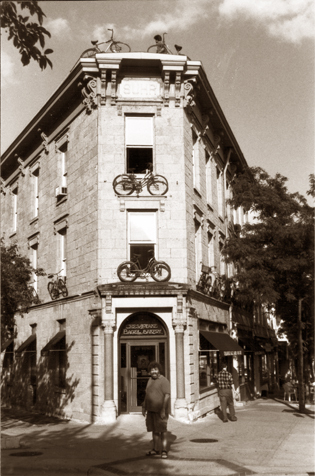 Red Bicycles Adorning the building at 102 King Street, Madison, WI. Twenty five years after Madison’s original free bicycle program ended, this new one began. The local press was (and is) very supportive of the Red Bike Project. The community has responded with generous bicycle donations. The city supports the Red Bike Project in many ways from free bicycle licenses, to city employees who return damaged and abandoned Red Bikes. Mautz Paint and other local vendors have given discounts on red paint. Wheels for Winners donates bicycles that do not work for their program. Budget Bicycle Center repairs and stores the bicycles during the winter. Volunteers paint bicycles every May. With donations, minus losses, the Red Bike Project’s fleet has been stable at a little over 300 bicycles.